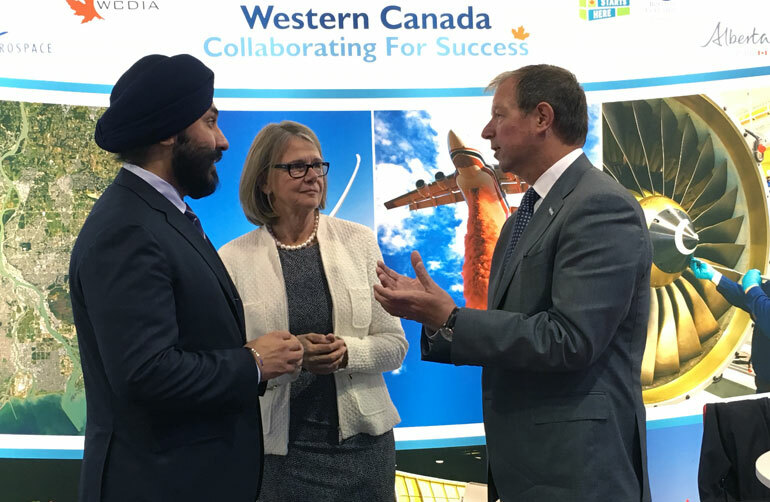 Avcorp CEO Peter George (right) discusses the new Learning Factory partnership with UBC Deputy Vice-Chancellor Deborah Buszard and Minister of Innovation, Science and Economic Development Navdeep Bains (left). The two parties, represented by Avcorp CEO Peter George and UBC Deputy Vice-Chancellor and Principal Deborah Buszard, signed an MOU today at the Farnborough International Airshow in the United Kingdom. Avcorp Industries is a leading supplier of integrated composite and metallic aerostructures, based in Delta, BC. The Learning Factory will integrate industrial production with learning and research and provide UBC students and faculty with new opportunities for research, knowledge translation, and hands-on experiential learning. The Learning Factory will also provide technical and skills training opportunities for students from partner institutions, such as Okanagan College. Through the development of a composites research and production facility at the UBC Okanagan Innovation Precinct, as well as an integrated digital simulation facility at UBC’s Vancouver campus, the Learning Factory will provide Avcorp Industries enhanced ability to evaluate and improve manufacturing efficiency.